Tennyson is author of The Essential Guide to Guitar Virtuosity, which is an excellent ebook we recommend and can be downloaded from guitarspeedsecret.com. He’s just sent us this brand new lesson on speed picking, if you like this lesson make sure you visit his site! Speed picking is one of those things that can take a lot of time, patience, and depending on how you train – work. In fact most guitarists, let alone anyone, would agree that spending so much time practicing with very little effort is just not the most desirable option. This is why a lot of times a student will go in search of a good guitar teacher to help them refine their technique and improve their own speed picking. Most guitar players learn how to speed picking, sweep, tap, and any other trick you can think of on their own. It is possible however to learn these things from a teacher, provided that you find just the right mentor for the job. If you decide to go in search of a guitar instructor who may be able to help you master advanced playing, you’ll want to get as specific as possible so that you don’t end up wasting your money. Here are some things that probably should be considered. Does the potential instructor have or has had similar goals to yours? were they in your shoes as well? aside from teaching, are they actively practicing guitar, composing music, or shredding in their free time? 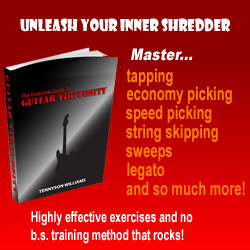 You’ll want to get as enthusiastic a guitarist as possible for your new shredding sensei. Its important to know what kind of style of music they appreciate the most. This isn’t always extremely necessary, because there are a good number of instructors out there who listen to many different genres, and can typically shred through most of them. However, you should be aware that different styles can lead to different approaches for advanced technique. If you get a jazz guitar player as a guitar speed instructor, they may teach you things differently than a metal enthusiast. Perhaps they would be too way out for your own tastes, or maybe they would want to show you more Be Bop styled passages. Whatever the take is, make sure that you can apply it to your own playing and goals. This is very important. Its common to find a really knowledgeable teacher…..who is a nut job. I’ve heard so many horror stories about a young student get a perfectionist with a temper for a teacher. When I took piano lessons years ago, I had a similar experience, and it was not only frightening, but down right degrading. You’ll want to find a teacher who is willing to work you on your schedule, and with your learning pace in mind. A teacher that can show you things and explained concepts to you in terms that you as a person would understand is ideal, but not all teachers are this way of course. 4. Do They Show You Discipline? An instructor who has a good attitude, and who can show you a little discipline can be a great friend. This type of teacher should be willing to show you through their own playing, what a little buckling down can do. Their job should also be to share with you their own beliefs about practice and playing. To conclude this, if you’ll notice – pretty much all of the points highlighted above point to one thing. A role model or a hero as a teacher will inspire you much more than a dead beat if you are looking to improve your guitar speed.